Usually the more efficient the better. Up to 13 seer for air conditioning equipment and heat pumps, 92% efficient for gas heating equipment. This is especially true if you are in hot areas (summer) and cold areas (winter) and, of course, are paying the heating bills. Heating and air conditioning is the major part of your utility bills. For most areas 75% or more. Seer stands for seasonal efficiency ratio and is a measure of efficiency sort of like miles per gallon for your car. Many older air conditioning systems have seers of 6.5. 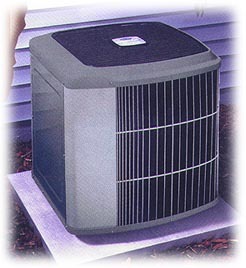 If you buy a new air conditioning unit with a seer of 13, you will cut your cooling cost in half. To find the difference in operating cost of two seer units, just divide the smaller number by the larger number (i.e. ; a 13 seer unit costs 76.9% as much to operate as a 10 seer unit. 10/13=.769. For furnaces, a 92% furnace costs 86.9% as much to run as an 80% furnace). Since air conditioning units can last 15 years or more and furnaces 30 years or more, the operating cost savings of the more efficient systems pay for themselves many times the difference in the first cost. Your dealer has operating cost programs that can show you the anticipated savings you can get with higher efficiency equipment. As an added benefit, higher efficiency equipment usually is higher quality, lasts longer, and is quieter than lower efficiency equipment. The lowest efficiency equipment that can be sold in the U.S. today is 10 seer for air conditioning equipment and 78% efficiency for furnaces. Tip: Buying a high efficiency heating & air conditioning system can result in a higher resale value for your house. In fact two recent studies published in the Appraisal Journal found that each one-dollar in annual energy savings adds $20 to your home's resale value.